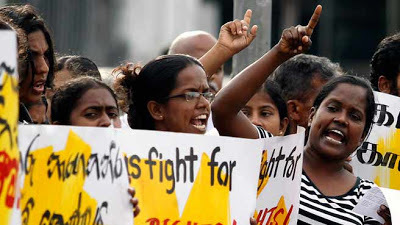 ( January 13, 2014, Colombo, Sri Lanka Guardian) Saudi Arabia and Sri Lanka are due to sign a landmark labour pact on Monday in a renewed bid to regulate hiring of domestic workers from the island nation and to ensure protection to all domestic help already employed in the Kingdom, a Saudi newspaper reported. Arab News said the agreement will be signed by Dr. Ahmed F. Al-Fahaid, deputy labour minister for international affairs on behalf of the Kingdom and the Sri Lankan Minister of Foreign Employment, Promotion and Welfare Dilan Perera. He said the labour agreement for domestic workers recruitment was a joint effort by Riyadh and Colombo to create a unified and well-regulated system for recruitment with emphasis on monitoring the working conditions of workers. “The pact will cover 12 categories of domestic workers including housemaids, drivers, cleaners, and waiters employed by individuals,” he was quoted as saying. Sri Lankan Ambassador V. Krishnamoorthy welcomed the joint initiative stating that it ensures rights and safety to domestic workers who travel to Saudi Arabia for jobs. “In fact, the new agreement will ensure that all job contracts entered into by domestic maids or workers traveling to the Kingdom are with the consent of the three parties concerned,” he said. “All parties including the sponsor, the agent and the recruitment agency will have to be aware of the details of the contract,” a report explaining the clauses of the new pact said. The paper said Sri Lanka has been lobbying for the rights of the domestic worker since 2012, and the agreement would go a long way in preventing cases of abuse and in ensuring fair and humane treatment to domestic workers. The pact also offers a protection mechanism, including insurance for domestic workers. At present, around 350,000 Sri Lankan workers are in the Kingdom, with domestic workers accounting for 80 percent of the workforce. Colombo is providing training courses for domestic workers prior to their departure to Saudi Arabia. Sri Lankan workers receive language training, hospitality training, lessons on how to run washing machines and home appliances, cooking lessons, and training on how to care for the elderly and children.